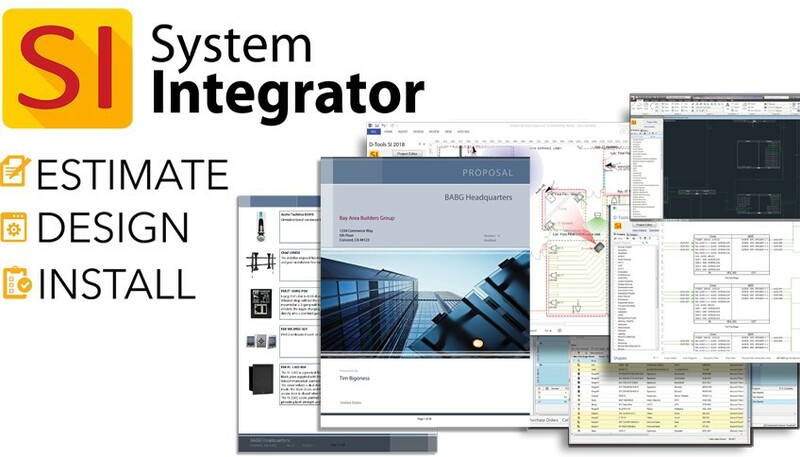 D-Tools to Demo System Integrator (SI) Update at ISC West 2019 Booth 34045 | KMB Communications, Inc.
CONCORD, CA — March 21, 2019 — D-Tools, Inc., the worldwide leader in data-driven system integration software, today announced the company will demonstrate powerful new capabilities to its award-winning, estimation, design, and project management System Integrator (SI) software solution – System Integrator v12 – at ISC West 2019 in booth 34045. ISC West is the largest converged security industry trade show in the U.S., with over 30,000 security professionals expected to attend and with new products & technologies encompassing everything from access control to unmanned vehicles from over 1,000 exhibitors & brands. Available now, the award-winning SI v12 delivers critical new productivity features – workflow management rules that help business managers maintain control over operating standards and business processes, project notifications that ensure project stakeholders remain fully informed, and calculated items that provide a powerful new method for establishing pricing parameters. SI’s new workflow management rules enable managers to enforce standards and operating procedures by setting admissible thresholds by which employees must comply. Workflow rules provide the necessary checks and balances that ensure minimum profit margin requirements are being adhered to, large proposals and purchase orders are acknowledged and approved by management before issuance, necessary team members are notified in response to customer needs, and more. Workflows can be configured to trigger an action and/or send a notification based on user-set criteria. SI users can set project notifications to inform internal and external team members of specific project- and sales-related activities such as when a proposal exceeds the stated budget or the profit margin falls below the acceptable minimum, when a contract is approved, when a project requires engineering drawings, when a change order has been created and is ready for review, when tasks have been assigned, and much more. Notifications ensure that project stakeholders remain informed so they can adapt, respond and stay on-task as project parameters change. Notifications can be sent to SI users in-app, as well as emailed to both internal and external stakeholders. Cost and sell prices can now be calculated based on user-defined pricing parameters. At the most basic level, this feature allows SI users to calculate a unit cost or sell price of a product or labor item based on some established value and formula. More importantly, system integrators can now use a project’s equipment total to calculate project labor, design fees, freight charges or a budget for installation materials. Additionally, the field labor total may be used to calculate a project management budget, or the project total can be used to calculate pricing for a service contract, and much more. In short, SI customers can now apply percentages, mark-ups, mark-downs and other functions to maintain accurate and consistent pricing across projects. To see how D-Tools System Integrator can deliver profound visibility and results, sign up now for a free, personal online tour by visiting http://d-tools.com/live-demo-webinar/. A free 30-day trial of D-Tools can also be downloaded anytime at http://d-tools.com/hosted-free-trial-signup/. D-Tools is a worldwide leader in accessible, highly accurate business software that caters to the unique and diverse needs of systems design and installation firms. The company’s on-premises software, System Integrator™ (SI), and new cloud-based platform, D-Tools Cloud, are robust solutions that help manage all aspects of an integrator’s business, including sales, comprehensive system design, project documentation, procurement, and project management. Today, more than 6,000 companies in over 80 countries use D-Tools’ award-winning software to streamline business processes, leading to improved operational efficiencies and increased profitability. Find product updates and related information by following D-Tools on Twitter, Facebook, and LinkedIn. All products, product names, trademarks, and registrations mentioned are the property of their respective owners, all rights reserved.